Sitting in her apartment over the summer, ski jumping sensation Sarah Hendrickson carefully eluded questions that presumed she already had secured a chance to compete for a historic gold medal at the upcoming Sochi Olympics in Russia. Just weeks later, the 19-year-old reigning world champion blew out her knee in a training crash in Germany, throwing into doubt her ability to recover in time for an Olympics that will feature her sport for the first time — after a long fight for inclusion led by Hendrickson’s older teammates, all from Park City. Hendrickson still made an appearance at the U.S. Olympic Committee’s media summit just a few miles from her home recently to say she remains hopeful she can do it, but she did so while wearing a knee brace, walking with a cane and occasionally getting shuttled in a wheelchair, with just four months until the Olympics. “My goal right now is, in January, I’ll be jumping,” she said. That would allow Hendrickson a chance to regain some form and confidence, maybe compete in a World Cup event or two. But Hendrickson knows nothing is assured. She knows there’s a chance her body won’t heal in time, despite spending six hours a day in physical therapy at the U.S. Ski Team’s Center of Excellence in Park City after performing some 12,000 jumps in her life. Her trajectory is frightfully close to mimicking that of fellow Utahn Noelle Pikus-Pace, the skeleton slider who was the reigning World Cup champion and gold-medal favorite before a runaway bobsled broke her leg. She tried valiantly, but was unable to recover in time for the 2006 Turin Olympics in Italy. “Obviously I know that if my doctors tell me that I’m not ready or I don’t pass my testing results — stuff like that — and I know it’s a possibility, I won’t jump,” Hendrickson said. 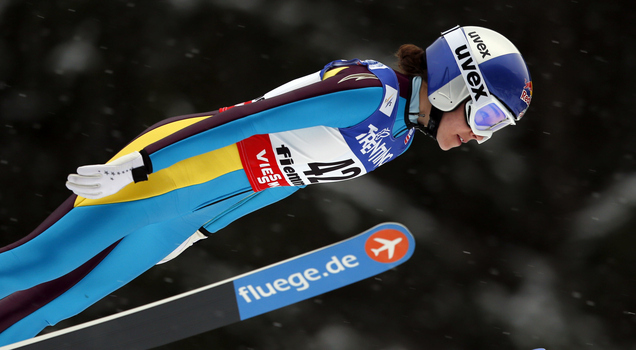 Hendrickson was training on the large hill in Oberstdorf on Aug. 21 when she crashed, tearing her anterior cruciate ligament, medial collateral ligament and meniscus. All three were surgically repaired once she returned home from Germany. She had just soared a personal-best 148 meters, suggesting she had hardly lost the top form that allowed her to beat 16-year-old rival Sara Takanashi of Japan at the world championships last February, after Takanashi had taken the overall World Cup title from her. The U.S. Alpine Championships, which brought thousands of fans to Squaw Valley this spring, will be returning to the resort next year. Set for March 19-23, the championships will be staged after the XXII Olympic Winter Games, which will be held Feb. 7-23 in Sochi, Russia. Athletes expected to compete at Squaw include Julia Mancuso, who won the Olympic gold medal in the giant slalom at Turin in 2006 and claimed two silver medals at the 2010 Games in Vancouver; Ted Ligety, Lindsey Vonn, Bode Miller and Mikaela Shiffrin. “It’s great to get to race at my home mountain, and it’s awesome to have Squaw’s support for ski racing,” Mancuso said. “We had a hugely successful event this year, but will be offering even more programming in 2014 as we welcome our American Olympians home from Sochi with a community-wide celebration honoring athletes across the winter disciplines,” said Andy Wirth, Squaw Valley CEO and president. Prime-time television coverage of the Winter Olympics will start a day early next year in Sochi — with Shaun White the likely star. NBC will air events the night before the opening ceremony, the first time a U.S. broadcaster has done so. On Thursday, Feb. 6, 2014, viewers will see team figure skating, women’s freestyle moguls and White’s event, slopestyle snowboarding, for both the men and women. With 12 new events for Sochi, including team figure skating and slopestyle, the International Olympic Committee needed to expand the length of the games. And since Thursdays are always a big night for TV viewership, NBC was happy to get a head start. Some Olympic competitions have been held before the opening ceremony in the past, but this is the first time an American TV network has started its prime-time coverage early. NBC will go from 17 to 18 nights of telecasts.